Jaxon: "The Tides" has some concept-like qualities to it for sure. The first song on the record, the title track, deals with how life is filled with many opportunities and possibilities that can pull you everywhere but no matter where you are swept off to or the path you decide to take, it is always important to stand firm in yourself and your beliefs. The next 3 songs, "Only Words", "X", and "Understanding" are all their own things. "Only Words" talks about the importance of words and how people toss them around to hurt people, especially words that can trigger people and their past abuse. So many people take so many words so lightly but fail to realize that one word can put someone back in a situation that could have been the most painful experience of their life. "X" is a straight edge song and that's is. Proud to be, and it's more than an X to me. "Understanding" is a goofy short song that everyone bullied me into having on the record but I have learned to love it. "Drift" and "Swim" bring it back to the concept-like aesthetic of "The Tides". "Drift" talks about my struggles with my direction in life. I don't know exactly where I should be, or what I should be doing, hence "I drift on, I drift away". "Swim" is my realization that as long as I am who I am, I know that I am strong and I will find my own way or, "the strength to swim". The strength to try and to continue on in this life comes from within yourself and relies on your own trials and tribulations and the ability to be steadfast. The tides come in, and they come out, they have low points, and high points, but they are always there and they are always a constant. Jaxon: In my opinion, people either have the drive to create or destroy, and differing opinions and views and morals don't really affect that. You can clearly have two different people with differing beliefs and ideas that have the same desire to move things forward (in their scope of moving things forward, that is). Maybe it's a natural instinct of survival and protecting the world around you, but I think people most often share this desire to create a better world. Jaxon: Rusty grew up in a predominantly lower to lower-middle class neighborhood, and funding was bad enough as a kid, but after the "No Child Left Behind" thing got going, the standard got dropped to an absolute minimum. Things that would have been common sense to teach in school became things you had to find out on your own. Teachers stopped teaching and just started evaluating standardized tests. Eventually, it wasn't about education anymore. It was about pushing kids through a system. In other countries, there is a still a strong emphasis on education, whereas here it's all about standards and sports. Rusty's fiance is Canadian, and they've engaged in a lot of dialogue about the differences between the education system, and it's frustrating to see how much it's all degraded in the states. Politicians and lawmakers like to think that they care, that education is an investment for the future, and yet most government expenditure goes towards a perversely excessive military budget and numerous other political niceties that distract from where the money should be going. When we stop caring about education, we stop caring about our future. Jaxon: The whole time I have been answering these questions I have been listening to Youth of Today. It's so important to have a positive outlook in your life because if you don't you cripple your ability to succeed. It's an attitude. It's a flame inside of you that pushes you on. We've got that PMA! Jaxon: My experiences with drugs and alcohol are next to none. When I was 13 all of my friends become curious and started to experiment with drinking and smoking. I also tried but never drank enough to get drunk and I have never been high. I have always been deeply interested in music and at this time I was listening to really bad metal and core music but a few bands represented this thing called "Straight Edge" so I became very interested in it. I took a very unpopular stand against all my other friends by claiming Straight Edge at a time where they were diving head first into drugs and alcohol. I was bullied for my choice in early high school but people just got over it and knew me as the kid that didn't do drugs and I even met a lot of people like me or that were all for my choice. Of course in the natural world Straight Edge is a very confusing thing to normal people because of the heavy influence that drugs and alcohol has on everything, but I would rather be myself and live my life to my own standards than to give into being someone I am not or doing something I don't want to to be "normal". 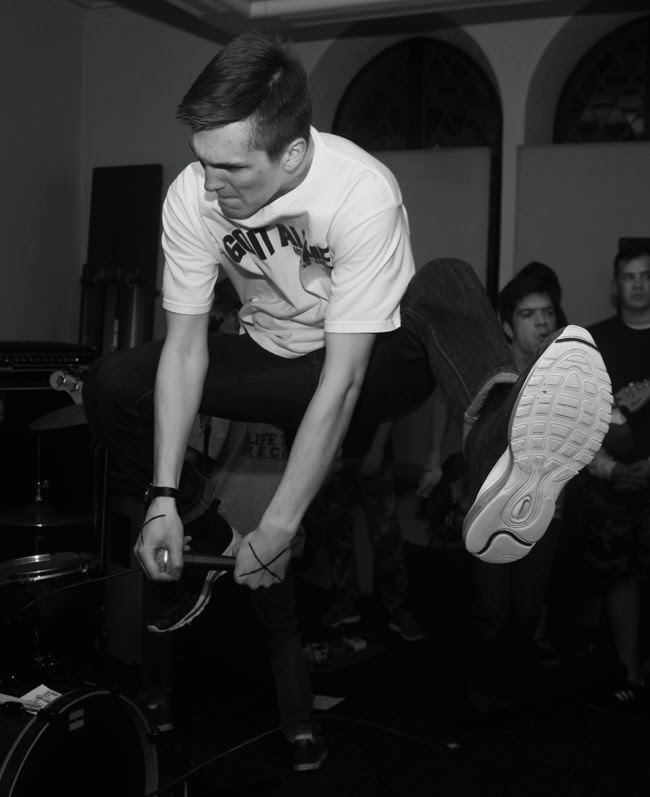 Straight Edge is who I am and it's exactly who I want to be. Rusty had a drug and drinking problem before he claimed, so Straight Edge means a great deal to him. He grew up with his mother having those same problems and surrounding herself with similar people, and it created this complacent attitude to it. It was just normal, nothing to be concerned about. So, by the time these things started appearing in his life (drugs, drinking, smoking), he didn't see anything wrong with it, and seeing it growing up, he wanted to know what it was like, so he kind of dove in head first. By high school, he was skipping class to get drunk or high, coming to school either stoned or on pills, and it was an uncool vibe. He got so caught up in it that he felt himself losing control. Once he hit his low point he turned to Buddhism and it got him on the track of living a positive and clean live to better himself. Straight Edge is an opportunity to create control in your life and be in charge of what influences you. In a world where we have so little control and we are surrounding by suffocating influence, I think it's of profound importance to know that there is a commitment to a choice that can be made to maintain control of your own life. Jaxon: I am very interested and inspired by art and some of my favorite artists are Mark Rothko, Andre Kertesz, and Claude Monet. Also film is a big inspiration to be aside from music. Rusty loves literature such as, The Bhagavad Gita, the Buddhist Sutras, and the writings of Kierkegaard, Nietzche, and Camus.